Welcome to EAGLEyeONE Magazine and online journal. EAGLEyeONE is a free journal offering articles, inspiration, and positive ideas to readers interested in holistic health, transformation and LIGHT related topics. 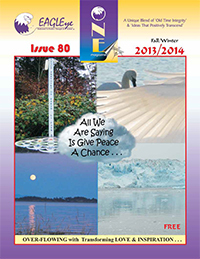 Now published twice a year (spring and fall) on beautiful Vancouver Island, British Columbia, Canada. The magazine has been sharing positive news since 1993 with a unique blend of old time integrity and ideas that positively transcend! EAGLEyeONE is also considered to be the Voice for metaphysical and New Age concepts and ideas. Within this website you'll find highlights from past and present issues of the magazine, a holistic health business directory, event listings, classifieds, information on the Grand Council of Light, and oracles to give you hope and inspiration. EAGLEyeONE is dedicated to bringing together those who believe in peace and equality for all. we can and will change the world.